Palmyra, VA, July 02, 2018 --(PR.com)-- More and more, organizations are judged not just for the quality and price of their products but for who they are. Many customers now expect a business to be a force for good. 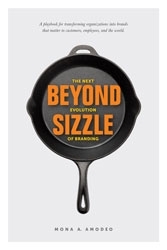 "Beyond Sizzle: The Next Evolution of Branding" is a playbook for building a brand that matters. Brands that matter are companies we love to love because they stand for something more than what they sell – brands such as Ben & Jerry's, IKEA, Patagonia, and Tom's of Maine. They have earned a reputation not only for delivering quality products or services but also for being great places to work, for pushing their industries forward, and for striving to make a positive difference in the world. Since the 1950s, companies have relied on branding as an advertising tactic to cut through the clutter of choices by building emotional connections between the qualities of their brand and the motivations of their audiences. When done well, branding creates a competitive advantage by building relationships people trust. However, three emerging trends in today’s complex marketplace have presented new challenges to influencing the choices people make about who to buy from, work for, and invest in. These shifts include: the hyperconnection of people forged by technology, the growing skepticism of the formal communications pushed out by organizations, and the shifting expectations about the social responsibility of business. Successfully responding to these shifts is critical to creating the trust needed to position organizations to compete. "It's clear that 'doing well by doing good,' once considered a brand of charities or fringe businesses, is now a brand appropriate to many, if not all, organizations," says author Mona Amodeo. "'Beyond Sizzle' will help readers understand how to build that brand for their organization, one that will not only help them thrive economically but also have a positive impact on customers, employees, and the world." The opportunity to conduct a research project with global carpet manufacturer and sustainability pioneer Interface awakened Amodeo to what's possible when people are fully engaged in working for something they believe in and feel connected to. The research answered her question about if and how a company, not born with the DNA of sustainability values, could change its culture. What she learned, and describes in detail in her thought-provoking, inspirational, and practical book, is that organizations don't need to choose between profit and social responsibility, they can have both. "Beyond Sizzle" shows how. "Beyond Sizzle: The Next Evolution of Branding," published by Maven House Press, will be released on September 4, 2018, and is available for pre-order now at most storefront and online bookstores. Mona Amodeo, Ph.D., is a catalyst for transforming organizations into brands that matter. As the founder of the Florida-based branding consultancy idgroup, Amodeo leads a team of dedicated experts with a vision to move business-as-is to business-as-it can-be. Prior to opening idgroup in 1989, Amodeo was a broadcast journalism instructor and international documentary producer at the University of West Florida. She earned a Ph.D. in Organization Development and Change from Benedictine University and a master’s in Communication Arts from the University of West Florida. Maven House is an independent publisher specializing in forward-thinking business and personal success books by executives, business owners, educators, and other experts. Its titles are distributed worldwide by Publishers Group West (PGW)/Ingram. For more information visit mavenhousepress.com.